The broad expanse of the Ötztal Alps and the view of the glacier giants close at hand, define the experience of this tour along panoramic high-level trails. or can be downloadedhere for free. From the upper terminus of the Pitz-Panorama cable car on the Hinterer Brunnenkogel (3440 m), climb along a panoramic trail via point 3404 and across the moraine of the Taschach glacier down to the Taschachhaus. One of the oldest Alpine-Club huts, it was recently completely renovated and equipped with modern facilities – while retaining the charm of an alpine lodge. This route follows a partly secured path and finally crosses a glacier. 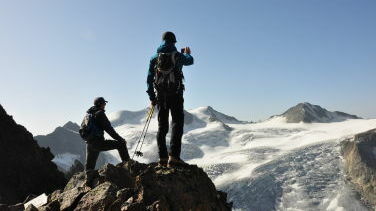 Therefore, alpine experience – and depending on conditions, also crampons – are required. Travel conveniently by train and Postbus to the tour’s starting point at the Gasthof Gletscherblick between Mandarfen and Mittelberg. The first day begins comfortably: The walk via Pitze and Taschachbach and brief ascent to the Taschachalm will warm you up for the day’s hiking. After a brief stop here the trail continues along an alp road that follows alongside the Taschach stream into the valley. Only during the final hour along the pathway to the hut does it sidle somewhat steeper up to theTaschachhaus. Once fortified by the breakfast buffet in the Taschachhaus, the second day begins with the Fuldaer high trail – three or four hours of panoramic views on the Ötztal glacial mountains! The nicely arranged traverse from the Taschachhaus to the Riffelsee lake runs along past Bliggspitze, Eiskastenspitze, Wurmtaler Kopf and Grubengrat. After crossing the Sexegerten stream, the trail continues always northeast across grass slopes and schrofen (steep, rocky terrain). Once accommodated at the wonderfully-situated Riffelseehütte, there is time in the afternoon to walk around the Riffelsee. The third day leads to the highest-situated hut in the tour. The Cottbuser high trail is the name of this partly secured path system that connects the Riffelsee lake to the Kaunergrathütte (2817 m). Soon after the Riffelseehütte, its lovely surrounding terrain is left behind, your trail continues across a sloping terrace beneath the Brandkogel through into the Alzeles cirque and crosses a gorge-traverse secured by chains, on the Steinkogel. The terrain then opens up once again and the path will take you through the Plangeroß valley, upward to the Kaunergrathütte. The mighty Watzespitze and the Verpeilspitze jut out here above the Plangeroß glacier and provide this last overnight stay in a hut with an even wilder setting. Even the finest tour finally comes to its conclusion. The last panoramic vistas await you, perhaps you'll see a few wild ibex. The long path leads down into the valley. It initially runs from the Kaunergrathütte and into the Karle, drops down even further past two tiny mountain lakes and descends to the hut path (Hüttenweg) in the Plangeroß valley. The Lußbach stream will show you the way now. The vegetation becomes more luxuriant with almost every step, the pastures more lush, and finally a few serpentine curves down to the Pitztal's valley floor, which you will join at Plangeroß. Cool your feet in the stream. Enjoy a refreshing drink while once again reflecting on the wonderful time spent on the Pitztal tour – the Postbus will then take you homeward bound. 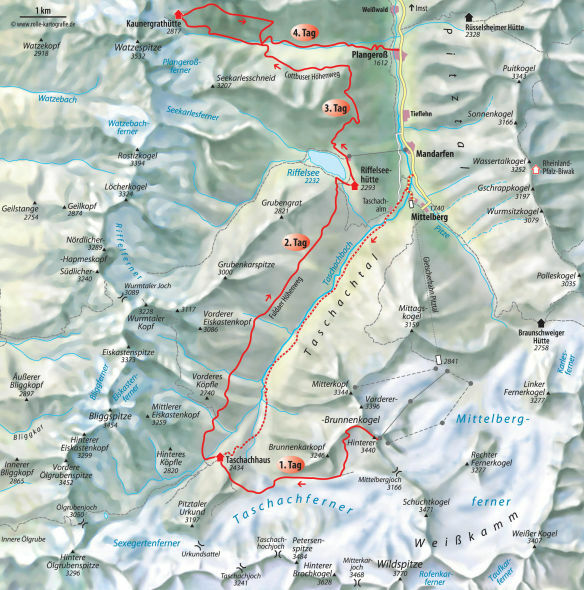 Take the A 95 to Garmisch-Partenkirchen, to Lermoos and the Fernpass to Imst. Further on into the Pitztal and to Mandarfen. 187 km, time 2,5–3 hr. Or on the A 8 to the Inntaldreieck, further on the A 93 past Innsbruck to the Exit 132 (Imst); into Pitztal and to Mandarfen. 256 km, time 2,5–3 hr.